Being senior shouldn't preclude owning a pet! (These happy pet owners and their companions are at the Ridgecrest Retirement Village in Page, ACT). I attended the Australian Companion Animal Council think tank earlier this year and met some wonderful people. 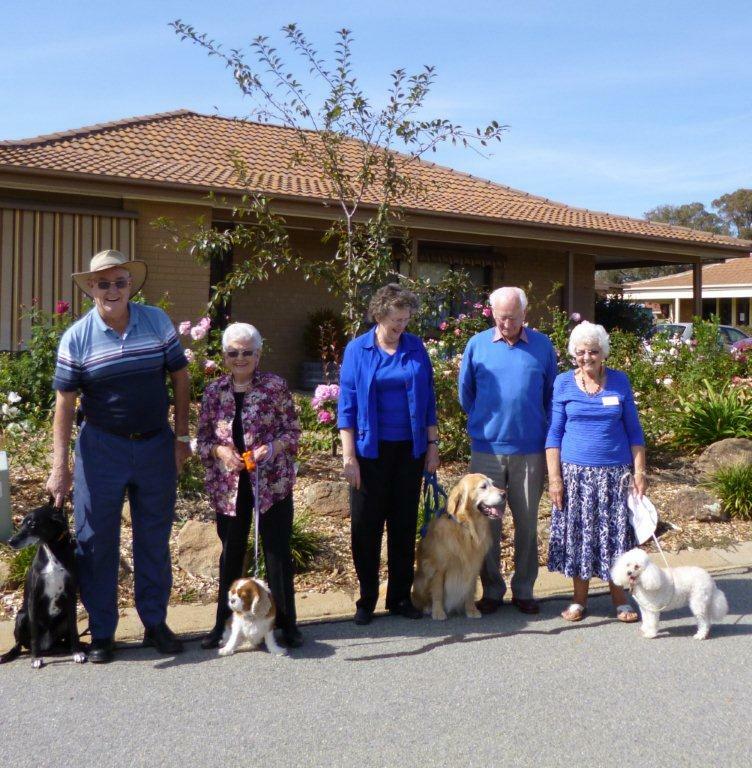 Topics included education about animals, renting with pets, access for assistance dogs and pets and aged care. Think about it - when older people go into palliative care, hospitals or nursing homes, they are often required to give up their pet. I can't imagine anything more heart breaking than being parted with your best friend during your greatest time of need. Di Johnstone is one woman doing her bit to change this scenario. She is involved in the Pets and Aged Care Steering Group I met her at the lift on the way into the meeting, and her passion for this subject is infectious. She agreed to answer some questions for SAT. (BTW Di has painstakingly provided a host of resources for anyone wanting to learn more, so please hit those hyperlinks in the text). Tell us a bit about yourself. Where did you come from and how did you get here? I am a retired public servant. As a child I grew up with with dogs and cats and have had animal companions much of my adult life. On retirement, I became a volunteer dog walker at Domestic Animal Services (the dog pound) where I helped to establish a volunteer program and now edit a newsletter for volunteers. I am also a member of ACT Rescue and Foster Inc, a local dog rescue group, and a Life Member of the RSPCA. You are involved in the Pets and Aged Care Steering Group. Who are they and what are their goals? Our primary goals are to make it possible for the rapidly growing number of older pet owners to continue living with, and enjoying the benefits of their pets, in various forms of aged accommodation, where this is feasible; and to find ways to help support older pet owners living at home at times of health crises. The Pets and Aged Care Steering Group (SG) was a direct outcome of a community forum in Canberra in May last year, hosted by Mary Porter AM MLA. The forum was well attended including by aged care mangers and village residents, other aged care professionals, animal welfare agencies and pet owners. The SG represents many expert interests – including a major aged care operator, aged care volunteers, vets, the RSPCA, a pet behaviourist and inhome pet support provider. We are working on informing governments, aged care operators and the community about the benefits to aged Australians of being able to continue a relationship with their pets. We encourage information in guides and on websites about pet friendly aged accommodation. We also focus on practical initiatives. We recently produced a handy flyer, now widely distributed in Canberra on local pet friendly aged accommodation options. We held a workshop last year for planners and architects and aged care providers on designing pet-friendly aged accommodation. This was presented by Virginia Jackson, an Australian and international expert in designing pet friendly cities and buildings. We are working on a website to make this information freely available to designers of aged care facilities. 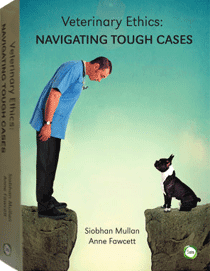 We plan to produce a guide to how to implement pet-friendly policies in aged accommodation. There is relevant experience in Australia - where some aged care providers have developed their own policies - and in other countries - in particular the UK, US and Europe. 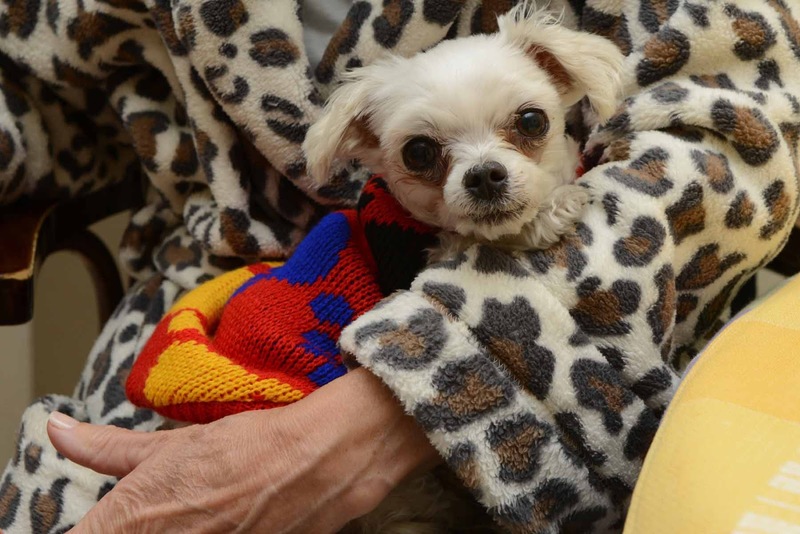 Individual SG members are also working on their own related initiatives, such as this program of “Senior Pets for Senior People” (see this link) developed by the RSPCA and Anglicare. As for those ageing at home, there is little care-related pet support, in particular for those less well off, and ill or facing a temporary health crisis. Providing this support will help keep healthier, happier, less isolated people ageing at home - something governments are keen to encourage. The SG is working with Communities@Work , an ACT- based regional community service, on a program to deliver an ACT in-home program to provide pet support targeted to people 65 and over who are frail aged, low income pet owners in Canberra ageing in place at home. With sufficient resources, it might be extended to assist pet owners transitioning to higher care. When this is operating, the University of Canberra plans an associated research study. The SG is also campaigning for assistance for pet support to become one of the standard services offered to all HACC clients in the new “consumer directed” home care packages. The SG will send a Submission to the planned review of HACC services when we know the timing of this. There are documented health, psychological, social and lifestyle benefits of pets. Why is it important for people in aged care to have access to pets? There are health, psychological, social andlifestyle benefits of ongoing pet ownership for older people - especially for those living alone. Pet owners know this. Pets are part of our family. If we live alone, our pets may be closer to us than our human families. They can be a reason for many people to get out of bed and face the world each day. They engage our attention and require our daily care. At a lonelier time, they also require us to interact with others. When we take a dog for a walk they connect with our neighbourhood and nature. Dogs can also make us feel more secure in our homes. In an otherwise silent world, we also talk to our pets and they help keep alive our communication skills. Wherever we live, they are our comforting companions, who we love and intimately share our lives. Many of us can’t bear to imagine living without them. How are pet friendly nursing homes different to those that do not allow pets? Circumstances for nursing homes will clearly be different to those for retirement villages. Pet-friendly nursing homes may allow suitable pets in some “low care” areas, where it is appropriate and also possible to manage pet welfare. In time, we would expect more nursing homes will be designed to allow for this option in low care. High care areas may want to have access to a manager or “facility pet”, carefully managed for animal welfare, and to dog or other animal therapy visits/sessions for people who would benefit from contact with animals, including dementia patients. As the number of dementia patients grows, there will be a place for programs that deliver one-on-one therapy in dementia case management in nursing homes. Are there any people or animals you've met who've influenced you to take this issue on? As a volunteer at a pound for some years I have seen what happens when animals are surrendered because owners cannot take them into aged accommodation. Often these dogs are older and harder to rehome. I was also struck when reading a UK study that it was estimated in 1998 that in the UK 140 000 pets were then relinquished each year by owners who could not take them into aged facilities, and of these 38,000 were euthansed (I am not aware of any estimates for Australia) and the Society for Companion Animal Studies “Pets for Life” campaign. I also heard many personal stories about older relatives and friends who suffered the tragedy of being parted from a beloved pet companion and others who refused to move when they should because of a pet. It seemed that other countries were doing better than we were in allowing people to bring their pets into aged accommodation. Very important, a local politician, Mary Porter AM MLA, who had vast experience in volunteering and aged care issues, agreed this was an important issue and was prepared to host events, meetings, undertake publicity and lend her considerable and very valuable credibility and support to getting a better outcome for older people and their animals. And finally, the Chair of the SG, the wonderful Jan Phillips, who singlehandedly, while manager of the Body Shop in Canberra, ran a volunteer-based pet support program for 12 years for people living at home and facing medical crises, was and continues to be an inspiration. You've done a lot of research about pet friendly aged care overseas. How does Australia compare? Australia appears to be well behind the UK, Europe and US but the situation is improving. With our population predicted to expand to up between 31 to 43 million people by 2056 (ABS) and with some 25% of us then being 65 years and over, there will be a lot of pet owners in this aged population. If we don’t find way to make it possible for older people to continue living with their pets in aged accommodation, there will be trauma for very large number of owners and pets at one of the most difficult times of an older person’s life and vastly more healthy companion animals turning up in shelters around Australia or being unnecessarily euthansed at the local vet. We need to look at this issue now and to plan for the future. Helpfully the demographics will assist to bring the change needed. The population which is now beginning to move into aged accommodation has very different expectations than previous ones and will require providers to offer more lifestyle choices. Keeping their pets will be one of those choices for the new aged population and there are commercial opportunities to meeting this consumer demand. We also need to find ways to provide support to pet owners living at home alone with pets during health and medical crises or there will be both people and pet welfare issues. [Ed: see below for an example from Banfield Charitable Trust in the US - you will need tissues]. What advice would you give a pet owner who needs to move into a nursing home, retirement village or aged care facility? Take look at this flyer for advice and options. Do you have your own pets? Can you tell us a little about them? I have an almost nine year old golden Labrador, Oscar, and a 13 year old cat, Moonshine. Oscar and Moonshine are part of my family and much loved companions. Oscar was found wandering in Canberra with serious injuries and ended up at the pound. I brought him home and nursed him back to health. Oscar was a very energetic dog but with age is now calmer, although he still loves long walks, swimming and chasing a ball. Oscar has a lovely, people-focused temperament. He and I bring dog therapy to an Alzheimer’s patient once a week at a local nursing home. Moonshine is a highly opinioned cat. She arrived at our door in the arms of one of the neighbourhood children who had found a basket of kittens on the doorstep. Moonshine is also very people-friendly. She likes to sit firmly on an available lap when someone sits down and often sits in the middle of my desk as I work. She talks very loudly and has the household – and Oscar - under control. How can we support this cause? Talk about the issue. Write an article or letter to a newspaper. Start the conversation in your local area. Contact local aged accommodation and ask if they allow pets. Warmly congratulate those that do and advertise them to people who need to know. Just remember that encouragement – not criticism – is by far the best way to persuade the aged care providers. If there is a local program to provide in home pet support, become a volunteer. Do you have any favourite pet or vet related links? Yes. The Australian Anthrozoololgy Foundation; A web-based source of information on pet-friendly aged facilities. An example of aged related pet support program is the RSPCA's Pets of Older Persons program; and for other more broadly based in-home pet support programs try here; here; and here. Finally, do you have any messages for vets, vet students or pet owners? For pet owners: Don’t assume that it is not possible to take a pet into the aged accommodation you are considering. Ask and tell them how important your pet is to you. Make sure you provide all the information you can about your pet and check out this flyer for options. Some of the Australian organizations on this flyer are national. For vets: know which aged facilities in your local area allow owner pets so you can let clients know. Encourage owners to ask if they can take a pet. Consumer expectations will encourage more aged care providers to open up pet-friendly options. Be prepared to speak to the aged facility if asked and offer to provide a reference for the owner’s pet. Provide assistance, perhaps on a discounted basis, to older pet owners in aged accommodation. Be prepared to consider discounted services for older pet owners who are living at home with their pets and for community programs that support these owners, especially those living alone, on low incomes and in greatest need. At the same time keep a close watch on the welfare of the pets you see and raise issues if you have any concern. For vet students: consider pro-bono work as a community service in local aged care accommodation where there are pet owners to assist older people with caring for their pets. If you'd like to read a bit more, Di wrote a beautiful piece for the Sydney Morning Herald entitled "Why force best friends apart? ".